Jouvet Park is a garden in composite style, that is a juxtaposition of regular and landscape styles. It stretches over 7.5 ha and bears the imprint of landscape architects such as Vacherot, Redont, Touret, Martinet. Build by the company Nivet from Limoges, it was inaugurated in 1905 by Mr Loubet, the French Republic President at the time. From the view point, you can see the famous ruins of Crussol Castle (registered in French sites trust in 1942) and the mountains of the Vivarais. In the Park, more than 800 species of trees give to the park a botanical interest, improved by recent works of tree reorganisation. The Park shows also quite different artistic works of great interest, qualified by the French writer Louis Aragon as "the elegance of the park". In 2006 the park got the label "Jardin remarquable" (outstanding garden) thanks to its botanical, historical and landscape qualities and its artworks. 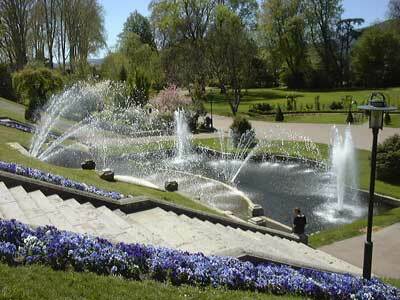 Jouvet park in Valence is a garden to discover, for the pleasure of eyes and mind. Guided tour "Go to the gardens" : free. Others Guided tours by appointment : 4 euros /person. Centre town, by the terrace of Field-of-March and crossroads of the avenues Comet and Provence.